The camera web site is still down , I can't get on either. I'm not sure when it will be up, I can see on the monitors but nothing online. Sorry, but as you guys all know this is out of my control. This is the four views you will see if you log on. 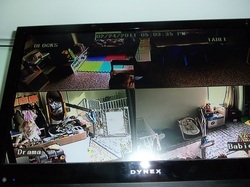 There are two cameras in each room. Current families come watch us learn and play at http://lisaschildcare.myq-see.com (I do not have control over the site itself, when it is available and when it is not). Parents, if you do not have the curent password please let me know, please do not share the password with others. If you do not see us, we are probably outside, waiting for lunch, or going potty. We will be back soon. If you can't get on to the site at all, try again a little later. The site only allows for 4 visitors at a time (sorry).